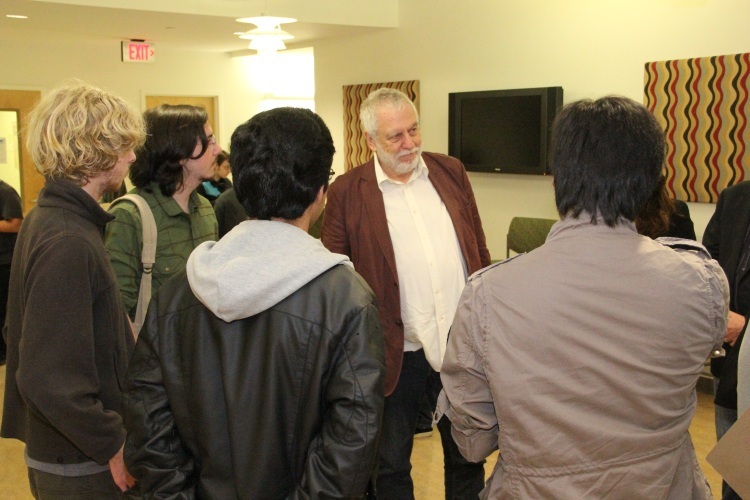 Nolan Bushnell holds court during Game Developers Week. What sparks a lifelong career in the video game industry? “All-night ‘Space Wars’ prototype gaming sessions in a basement with your fraternity brothers,” said renowned Atari co-founder Nolan Bushnell during his Feb. 28 question-and-answer session on the sixth floor of Donald Bren Hall. With the 1977 Atari Video Computer System and ET game cartridge that catapulted Atari into success on display behind him, Bushnell regaled an eager crowd of student game developers with anecdotes on the rise of the video game industry. Bushnell’s founding-father status, wealth of wisdom and personal success render him a celebrity in the field, but he remained approachable to students throughout his Q&A; students asked Bushnell about Steve Jobs’ involvement in the early years of Atari and Bushnell’s founding of Chuck. E. Cheese, among other topics. Bushnell’s cachet made his lively Q&A the highlight of the second annual Game Developers Week, a series of nightly talks with nine major game industry speakers hosted by UC Irvine’s Video Game Development Club (VGDC). Held in late February, the event offered students the opportunity to pick the minds of representatives from Blizzard Entertainment, Obsidian Entertainment, FireForge Games, Riot Games and (of course) Atari. The purpose of the week, according to VGDC president and computer game science major Connor Richards, was “to provide students the opportunity to experience professional talks and personal interaction with game developers, like at the Game Developers Conference, without having to travel and pay money. It was especially important this year, as GDC was scheduled during our finals week,” he added. VGDC is open to all UCI students with an interest in video game development — though many of the club’s members are ICS computer game science (CGS) majors like Richards. (This year will see the first cohort of graduating CGS majors.) Game Developers Week is just one of several events VGDC presents, with the mission to expand college game developers’ technical expertise, portfolios and professional networks. Other highlights include the quarterly “build a video game in a week” tournament Game Jam and the yearly tour of a game company’s offices.